The Femtoduino is an ultrasmall (20.7x15.2 mm) Arduino compatible board licensed under Creative Commons Attribution-ShareAlike 3.0 Unported (CC BY-SA 3.0). 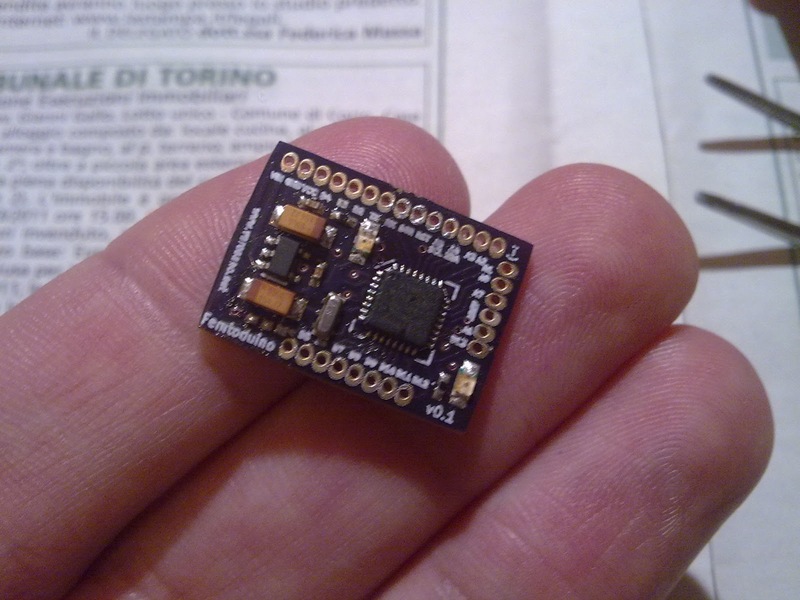 It is being developed by Fabio Varesano after he needed to add Arduino functionality to small objects. The result is what you can see on the picture of this post. Unfortunately, the board is not being sold, meaning you will have to buy all the parts, make the PCB or order it from a fab house and solder all the components yourself. Luckily, Fabio has shared everything you'll need to build this little devil. For Bill of Materials, Gerber files, schematics and KiCad sources please visit Varesano's website.